This classic Thai dessert is great warm, at room temperature, cold, or topped with crushed ice. It’s also pretty easy to make. 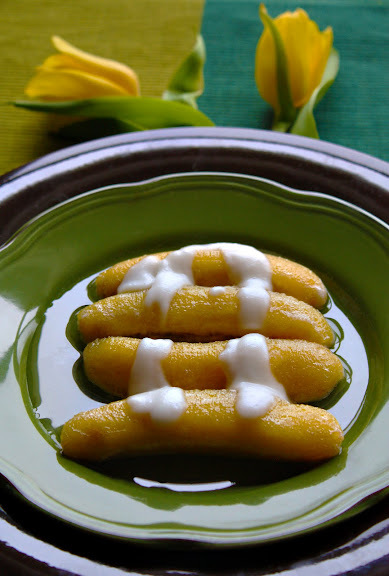 You need baby or nino bananas, though; regular cavendish bananas turn all mushy and weird in the simmering syrup.1 And don’t skip the coconut cream topping; it is the vehicle for the saltiness that this sweet dessert desperately needs. In a pot (wide enough for 10 baby bananas to float in a single layer and deep enough to hold half a gallon of water), mix together the water and sugar; bring the mixture to a boil. Drain the bananas and gently add them to the syrup; adjust the heat to achieve a gentle simmer. Simmer the banana in the syrup, undisturbed, for 8 minutes. Do not stir the bananas around or they will lose their shape and become “fuzzy” on the outside. With the tip of a knife or a wooden skewer, gently flip over each banana and continue to simmer for another 8 minutes. Turn off the heat. Let the bananas cool in the syrup to slightly warmer than room temperature. Meanwhile, make the topping by whisking together the coconut milk, flour, and salt in a small pot. Heat and stir constantly until the mixture starts to boil and thicken. Remove from heat and set aside. To serve, fish out the bananas from the syrup and place them on a plate. Drizzle the coconut cream topping over the bananas. 1 This is why traditionally only nino bananas (Kluay Khai) and burro bananas (Kluay Nam Wa) and never cavendish bananas (Kluay Hom) are used to make this dessert. Having said that, I’ve used cavendish before solely out of necessity and, though it didn’t yield optimal result, it wasn’t abominable. If you really can’t find nino or burro, which can be hard to find, feel free to use cavendish. Pick ones that aren’t so ripe; otherwise, they fall apart on you after cooking. 2 They should be about 50% yellow and 50% green. 3 Do not skip this step. 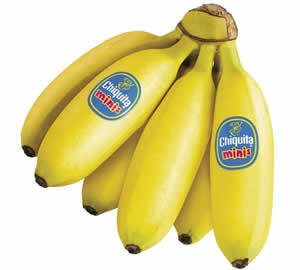 The salted water will help remove much of the sticky substance on bananas that are under-ripe. Failure to do this will result in unsightly brown spots on the cooked bananas. A tablespoon of salt for every quart (32 fluid ounces) of water should do.